I always go back to thoughts of all beings made up of the same energy. We have a lot of wonderful (and horrible) things we can do with that energy. Sending good vibes into your meal, and being grateful for what is laid before you, will bring positive results to the body. 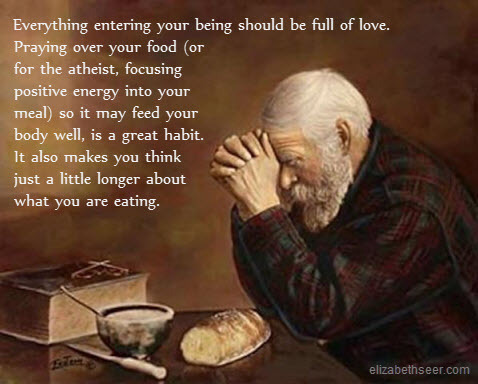 You needn’t be religious to send loving energy to your food before eating. It also doesn’t hurt that it forces you to think just a little bit longer about what’s before you and how it got there. food energy, food love, food prayer, gratitude for food, love your body, love your food, positive energy. Bookmark.